I'm not sure where you live, but here in Illinois it's some wacky weather. I know I start out talking about the weather on my blog all of the time, but it is wacky! Last week it was in the 90's, this week it's been in the upper 60's and rainy. Next week it is supposed to be back in the 90's again. These 30 degree swings make my laundry room pile up! Wow what a wonderful card!!!! Looks good enough to eat!!!! The colors are fabulous!!!!! Great job!!!!! Your card is so cute! I love cupcakes! Thank you for playing along with us at Birthday Sundaes. oh my sweet goodness this is so flippin' adorable!!!!! Thanks for playing with us at Cropstop's challenge blog. yummy!! great idea!! thank you for playing the cropstop challenge! Oh my gosh, this is so cute! 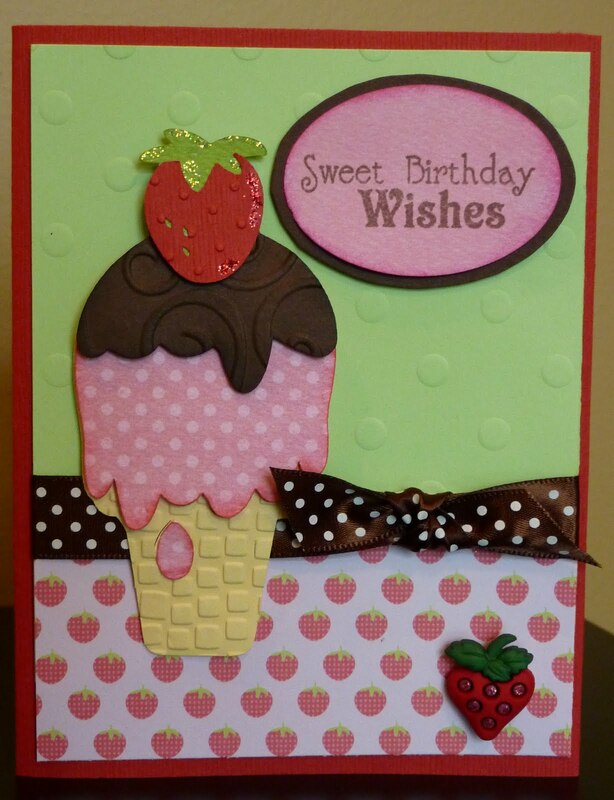 Love the embossed cone and topping! Thanks for playing along with our CropStop Challenge Blog! Very cute card! It's super yummy! 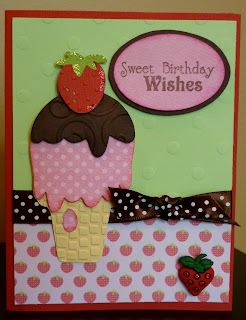 Great card.....love how you used the embossing! Thanks 4 joining us at Bithday Sundaes! Wow! I love your card...the paper, the strawbery brad....everything is just perfect! Thanks for playing along with us at SMS! Mmmmm....this looks fantastic! I love everything about it! The embossing is great! Thanks for playing along with us at Birthday Sundaes!